You must make reservations at least 5 minutes in advance of the time at Oliv Pit. 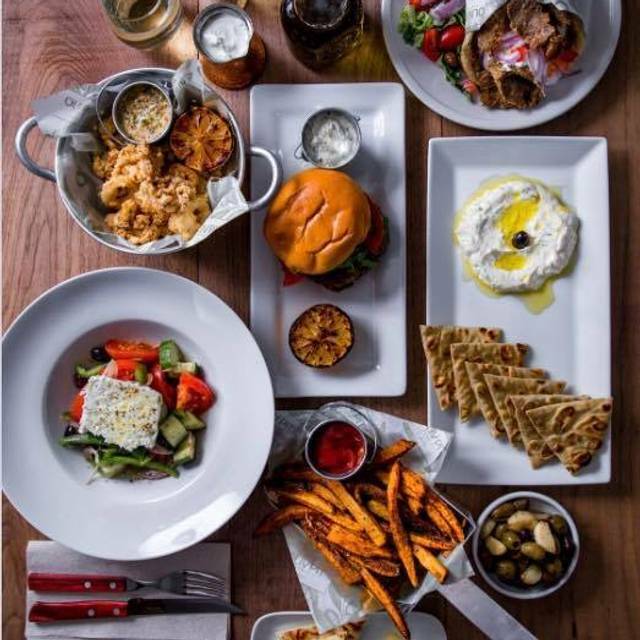 Oliv Pit Athenian Grille is purely authentic Greek. Our vision is to show the rest of the world how innovative, tasty and refined Greek food can be. We derive our inspiration from the traditional Greek table and reinterpret old time classic recipes with a modern twist. OLIV PIT, revives the sharing culinary tradition of Greece and is at the very core of our restaurant’s concept. We love Olive Pit. We go whenever we can. The food is really fresh, the octopus is the best I’ve ever had. We really enjoy our waitress and the owner is a pleasure. I highly recommend this restaurant. We have taken our friends that aren’t easily impressed and they loved it too. Service was ok but food was mediocre at best. Tried the highly pushed special of baked mixed vegetables as a side dish, inedible mush. Bronzino was over cooked and dry and lamb chops were just ok. We were hoping for much more from the new owners here. My wife came here with girlfriends for dinner and raved about the restaurant. So we decided to go with friends. Sat out back on the outdoor patio. They give you pita bread with olive oil and salt. Started with the GREEK VILLAGE SALAD, Tomatoes, Cucumbers, Red Onions, Kalamata Olives, Mint, Barrel Aged Feta, Green Peppers, Mountain Oregano, and Kalamata Olive Oil. It was very good but one of my pet peeves is when you tell the wait staff that you are going to share it and they don't split it in the kitchen. For mains, my wife saw the prawns when she was there before and ordered them. GRILLED PRAWNS with Olive Oil, Lemon Juice, Parsley. some were under cooked. just fair. I ordered the GRILLED WHOLE BRANZINO with Lemon, Capers, Preserved Lemon Vinaigrette, and Parsley. Supposed to be filet but I had some bones. Very Bland. First time back since new ownership took over. Huge improvement. Food was quite good and exceeded our expectations. We dine outdoors, in back of restaurant and it was extremely pleasant and made having a conversation easy. Service staff were helpful, efficient and welcoming. However, staff were stretched too thin. As good and hardworking as they were it was difficult for them manage so many tables. Other than that recommendation, we had a fine dinner and definitely plan to return. The food was quite good and well prepared. They were willing to accommodate to our desires. Most impressive, they are sensitive to gluten free needs (I have celiac) including gluten free pita. They still (we were there last year for an unacceptable experience) have not gotten service as well down as befits a quality restaurant even though the staff seem to be trying. Hopefully that will improve. There are many reasons not to return but most important my meal was just terrible. I ordered the grilled chicken breast. It arrived 5 minutes before my husband's entree. The breast was sliced into strips on the plate and despite being under cooked by my standards it was dry and can only be described as cardboard. There was absolutely no seasoning whatsoever. It was accompanied by a small romaine salad that was rusted and as unappealing as the chicken it lay beside. The picture posted on google was definitely not what I was served. Not only didn't a server come back to check on our meals but when we asked for a check with my dinner virtually untouched our server didn't even ask why. We don't like to make a fuss. The patio was busy and it would have been hard to be discreet. The restaurant was understaffed with two servers and a man (possibly the owner or manager) who seated people and delivered food mostly incorrectly from what we could see. It wasn't enough staff with the patio filled and a few tables occupied inside. They just didn't seem to have it together. We will not be returning! To start they didn’t honor our reservation, made on Open Table. The appetizers were dry, over cooked and tasteless. I ordered rare lamb chops and they came out like shoe leather. The place is expensive and not good. Don’t waste your time or money. Love eating outside, aumbiance was so nice! Food was great and food amazing! Very well prepared Greek food and extremely friendly and efficient service. Will definitely return to try other things on the menu. Once again, superb. Attentive service and delicious food. If you haven’t tried Oliv Pit, you’re missing out. Some fish over cooked and salt on finished string beans undesirable. Very attentive and no push. Definitely will return to experience other dishes. Full flavor. Had a very nice dinner out on the patio. We ordered several appetizers to share. Service was good and excellent food. All 3 of our party said we would recommend and return. We loved it Everything was wonderful. The only negative was the Greek Salad did not have a tasty enough dressing. It was definitely missing something. Will recommend restaurant to friends and we will definitely return at another time. Lamb Chops - were AWESOME!!!! Can't wait to go back and try some other dishes. Great restaurant! Service was great and we split the mixed grill for 2 which actually could feed 3 or 4 people! Food was ordinary and oily and the portions a joke!! Loved this place! Such fresh incredible ingredients! So authentic! Food was great and service was friendly. However, it took about an hour and fifteen minutes for the food to come out after being ordered. Many other tables had sat down after we had ordered and were done eating before our food was delivered. Service was good just extremely slow. It was Valentine’s Day so it may have just been an off night for them. Neighborhood gem! If you're in the mood for Greek food this is a small family own place with generous portions of deliciousness! Very reasonable prices, friendly service, cozy sitting area inside as well as outside. Greek salad was good but small. Lamb meatballs were good but I'd prefer no olive oil on top of tzaziki. They should have served the salad before the hot food, but it came afterwards. Nice back patio. It was sensational! A true dining experience. Our waitress was authentic Greek and was able to knowledgeably give us opinions and a history on dishes. I will be back and spread the word - Oliv Pit is not to be missed! Our first visit to this most welcoming space. The white washed brick makes a warm and comforting space. And we really enjoyed the food. The pita that comes with olive oil and salt is wonderful . It we couldn’t resist 3 appetizers... lamb meatballs with Tzasiki were quite tast. We had two spreads to eat more pita... Smokey eggplant and favs bean. Entrees were the grilled prawns... like mini lobster tails and short ribs. Really wanted dessert but was just too stuffed. We had a nice Sauvignon Blancto wash it all down. Good service by several energetic young women. We love the food and wine. Our waitress was Greek and she was able to suggest the best choices for us and our friends.